If you are planning to travel soon to the island of Ibiza and have not yet decided on the activities or visits to do on the island, pay attention to all the recommendations in this article. You will live a dream vacation! Next, we list our Top 20 things you should not miss near our hotel in Santa Eulalia Ibiza and our hotels near Cala Tarida. If something distinguishes Ibiza are its paradisiacal beaches of white sand, beaches that fall in love with anyone. Therefore, we invite you to visit the different beaches of the island and find the one that is perfect for you. Some of the beaches near our hotels in Ibiza are a must, for example, Cala Tarida only 15 minutes from Insotel Tarida Beach Sensatori Resort; Platges de Compte only 5 km or 9 minutes by car and with breathtaking sunsets that leave your visitors and the beach of Santa Eulalia breathless 2 km from our Hotel Insotel Fenicia Prestige Suites & Spa. Also, you should consider the beach of Ses Salines located just 30 minutes from our Insotel Tarida Playa, you will love it! Who says that during our vacation we cannot take advantage to get in shape and continue with our training routine? On the island you can practice various water sports either as a family, with friends or as a couple. Only 22 minutes by car from the Insotel Fenicia Prestige Suites & Spa you can go to the Port Esportiu Marina of Ibiza where you can live magnificent experiences practicing diving. In addition, at our hotel you also have sports equipment of high standing freely available to perform different sports activities within the gym space or outdoor sports areas. In our hotel you can find mountain bikes, helmets, 8 tennis courts, 6 artificial grass and 2 resin, 2 squash courts, gym, fitness room and yoga centre. One of the most remote traditions in all the towns is their markets of different types and various themes. The Sant Jordi market is only about 23 minutes and about 18 km from our hotel. In addition, it is very close to the airport, only 6 minutes away. The Nautical Medieval Fair that is celebrated in the month of May in the old town of Dalt Vila, is a sample of the Ibizan crafts at its purest point. We cannot fail to mention The Dalias Market, one of the hippie markets that takes place in Sant Carles de Peralta. It opens every Saturday from the month of April to October from 10am to 8pm. Finally, we recommend you take a look at The Forada Market, which is about 20 minutes away from Insotel Fenicia Prestige Suites & Spa. Here you will find products sown and elaborated in Ibiza, that is, a good opportunity to taste products from the island. For us, the well-being and comfort of our guests is paramount. For this reason, we invite you to our beauty sessions in our distinguished Insotel Fenicia Prestige Suites & Spa. You will enjoy a maximum relaxation with the services of massages, corporal and facial treatments, hydrotherapy, reflexology, Ayurveda treatments, among many others. They are one of the most pleasant and romantic moments that can be lived on the island. Without a doubt, there are numerous places from which you can enjoy an incredible sunset. The views of Cala Comte beach are really sensational. In addition, they are accompanied by very good music and an excellent atmosphere. The best? It is only 10 minutes from our hotel Insotel Club Tarida Playa. The White Island is not only desired by its paradisiacal beaches and coves, but also enjoys a variety of natural places that tourists take advantage of to make rural tourism. So book a couple of days in your holiday planning to go around the island by bike. On the island you will find many establishments that offer bike rentals, so the only thing that should concern you is what place to visit. Surely many of you have asked at some point: What to do on a Sunday in Ibiza? Well, only 20 minutes away by car takes place the Fiesta de los drums. A party where you will enjoy a chill-out atmosphere every Sunday afternoon in summer. We invite you to visit this beautiful beach of Benirrás and participate in the Fiesta de los Tambores, one of the best known events on the island. There are many things to do in Ibiza, among them we suggest you visit the different historical monuments of the island to relive the remote eras and know the different civilizations that have passed through it. If there is a monument on the island that is worth visiting, it is undoubtedly the historic center of Dalt Vila, considered a World Heritage Site. In addition to the Can Marçà caves with more than 100,000 years old. It is also a must in the city of Ibiza to see the interesting Phoenician sites in Sa Caleta or the Puig des Molins Monographic Museum, just 30 minutes from Insotel Tarida Beach Sensatori Resort, not forgetting the arts in Ses Fontanelles. Considered an authentic jewel of the Mediterranean, Ibiza is an island with great charm that surprises everyone with its splendid natural landscape. In it, you will discover corners that only the most curious and adventurous can see. In addition, you can rest in one of the many bars and restaurants located around the routes. We recommend you try the following route starting from Santa Eulalia, a few meters from the Insotel Fenicia Prestige Suites & Spa. Do not forget to savor the typical appetizers of the island before the meal, they are ideal to go belly up Balearic gastronomy. These appetizers are unique and their flavor will captivate you. We recommend you especially the Coca Ibicenca de Pintarroja, the payesa salad and the Greixonera. Who has not fallen in love with Formentera after feeling its natural beauty? Reserve one of your days to visit Formentera, we recommend you get up early to take the first ferry of the day and make the most of the time. If you are not sure how to get to Formentera from Ibiza consult our tips and recommendations on how to get to Formentera. In addition, here we leave you the best plans to enjoy Formentera. A vacation to disconnect from the rest of the world and enjoy the calm that nature offers us. This is the wish of many visitors of the island. We leave the coves of ibiza accessible by boat so you can go to them and enjoy a peaceful break deep into the Mediterranean. 13. Try the cake “flaó”, you will love it! If you want to taste one of the most authentic desserts on the island, the “flaó” cake will undoubtedly be the best option. It is a dessert prepared with goat and sheep cheese, mint and anise. Its origin dates back to the Middle Ages but today remains one of the most desired desserts both by residents and visitors of the island. You cannot leave without trying it! Es Cubells is a town located only 14 km from our hotels, very close to Cala Tarida. It is one of the smallest villages but it is distinguished by being on a large cliff. It only has a small church, some bars and a small cultural centre, but offers its visitors spectacular panoramic views. 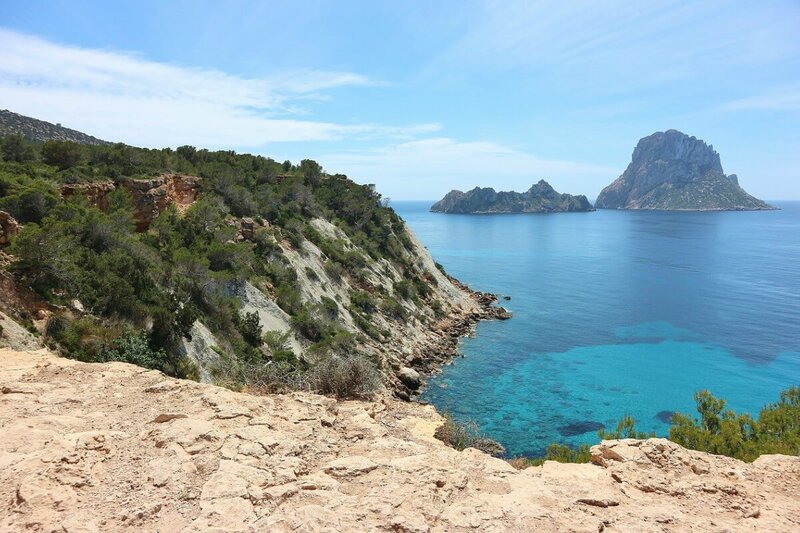 Once there, you can take the opportunity to visit the famous Natural Reserve of Cala d’Hort, it is one of the most attractive natural areas in the whole country. We love excursions, in fact we have already recommended hiking on the island, and however, this is different. Ibiza boasts the most peculiar caves of the Balearic Islands. The best caves to visit in Ibiza are the cave of Can Marçà which is about 30 minutes from our hotel in Santa Eulàlia, Ibiza. Also very interesting are the caves of light or the Cueva des Culleram just 22 min by car from our Insotel Punta Prima Resort & Spa. Speaking of Santa Eulalia, we took the opportunity to recommend a trip that you will surely love. To choose your walks well we recommend you take a look at the routes in Ibiza. Rice is one of the most typical dishes of the island and opens the appetite only with its aroma. So, savour all the flavors that are mixed in one of the best known dishes of Ibizan cuisine, the Bullit de Peix. Do not hesitate to see the beautiful lighthouses of Ibiza. We highlight the Ses Coves Blanques Lighthouse located just 20 minutes from the Insotel Club Tarida Playa and the Botafoc Lighthouse, just 25 minutes from Insotel Fenicia Prestige Suites & Spa. If what you want is to drink something in a cosy terrace or enjoy a lively night with music and the best DJ sets … in Ibiza you will get it! In addition, the city offers a wide range of traditional events and festivities such as the Medieval Fair that takes place in the heart of Ibiza town. They offer activities for all, souvenirs and typical Ibizan desserts. Finally, we recommend you to enjoy every second of your holidays. After seeing all that is hidden in one of the most famous islands of the Balearic Islands, do not hesitate to return to the comforts of our hotel where you can live unforgettable moments of relaxation. During the days in our hotels, whether in Menorca, Mallorca, Formentera or Ibiza we recommend that you forget your obligations and other responsibilities. It is time to disconnect from the rest of the world, to reconnect with yourselves and the magic of paradise that will surround you in Ibiza. We are waiting for you at Insotel!